Living Water Community Church arose from the vision of a group of young adults to start a multi-cultural urban church with vibrant worship, warm hospitality, shared life, discipleship and outreach in the Anabaptist Christian tradition. This core group from Reba Place Church in Evanston chose Rogers Park as the place to settle and begin public worship in 1995. They began in rented space at the United Church of Rogers Park with Sally Schreiner (now Youngquist) and Karl McKinney as founding pastors. After three years as Reba Place Church of Rogers Park, the group chose the name Living Water Community Church to signify their distinctive identity and financial autonomy from the mother church as they became a full member of Illinois Mennonite Conference. 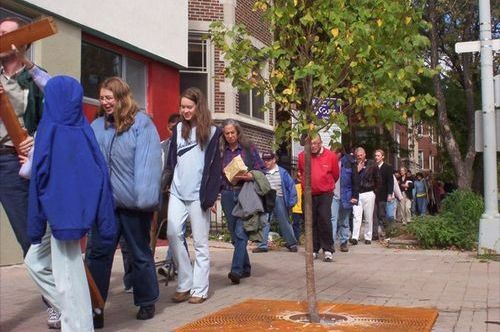 A fatal drive-by shooting of one youth by another at the corner of Pratt and Ashland in 2001 focused the church’s prayer and witness on the transformation of this corner. Members raised money and contributed sweat equity to buy the mini-mall at this location and rehab a 6500-square foot storefront to become their permanent meetinghouse in 2005. “Called to the corner to participate in Christ’s work of reconciliation in our church, neighborhood and world” became Living Water’s ongoing vocation. The church has attracted believers and seekers from many traditions and cultures. Cambodian members worship on Sundays with the English-speaking body for one hour and in their native Khmer language the second hour under the leadership of licensed pastor Samrach Nuth. A group of Bhutanese believers meets for Saturday night house church to worship in Nepali, under the leadership of Amos and Roma Shakya. A Swahili choir shares music from several members’ African worship traditions. Kristin Jackson became LWCC’s equipping pastor in 2011. LWCC continues to serve the neighborhood by hosting Vacation Bible school, after school programs, tai kwon do, a youth-focused “Man Night,” English classes, Bible studies and community groups in the LWCC Meetinghouse.